Good news, Community fans: the darkest timeline is almost over! 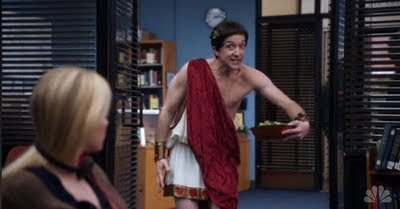 After being left off the midseason lineup last month, NBC has announced the Greendale study group's return to NBC Thursdays will be on March 15 back in its old 8/7c time slot. 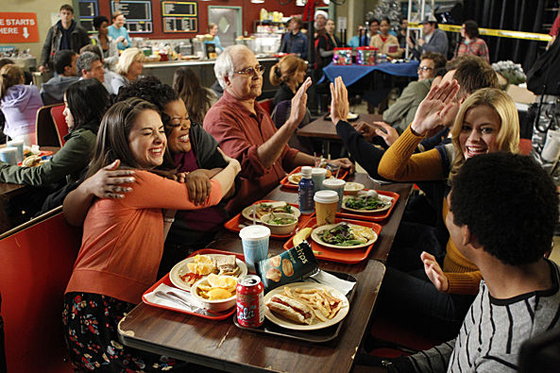 So, yes, the good fantastic news is that Community is coming back! Though it will have been a little over three months since the last new episode when it returns, that's nothing compared to the hell we went through with Cougar Town. And I am still (probably naively) optimistic about the chances for a Season 4. The show is only one season away from syndication, and it's ratings really are certainly less horrible when you grade them on the NBC curve. 30 Rock did just as poorly in the 8pm time slot over the last few weeks; if your Emmy-winning series is pulling a 1.5 rating, there's a larger problem at hand for sure. Parks and Recreation will take a 5-week hiatus starting March 15th and will return on April 19th to finish out Season 4 on Thursdays at 9:30 (after Up All Night has finished airing its first season). It was originally intended to finish sooner than the rest of the NBC comedies, so now it will just end in May like everyone else. No need to panic; I can't imagine this show not being renewed for Season 5. 30 Rock moves to 8:30pm for the rest of Season 6 and will hopefully improve on its 8pm ratings. Bent makes its series premiere on Wednesday, March 21, airing two episodes a night (one at 9, the other at 9:30) for the first three weeks and then settling into a 9pm time slot, assuming it isn't cancelled first. Best Friends Forever premieres on Wednesday, April 4 at 8:30pm. That's all a bit confusing, I know, but here's what you need to know: Community is coming back, and the NBC Thursday lineup will look like this: Community, 30 Rock, The Office, Up All Night/Parks and Rec. Somehow, the universe is starting to make sense again.